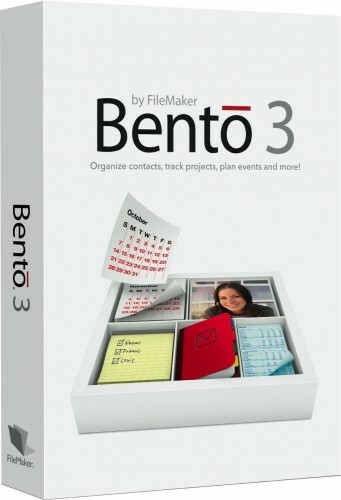 Meet Bento 3 for Mac, the breakthrough new version of the wildly popular personal database from FileMaker that's as easy to use as your Mac. Organize contacts, track projects, plan events and more – all in one place. Bento 3 now includes iPhoto integration, security options, multi-user sharing, and much more! Choose from 35 pre-designed templates included with Bento, download and import templates from others who share your passion, or design your own custom forms using beautiful themes designed by Mac artists. Bento links directly to the Address Book and iCal information you already have on your Mac to display your contacts and calendars in new and exciting ways. Add places to store important details about each person, event, or task, including related files, photos, and emails. Plus, changes you make in Bento are reflected in Address Book and iCal so your MobileMe account, your iPhone, and your iPod touch will be in sync. This Bento 3 Apple Mac software is sealed in retail packaging. In stock and ready to ship.